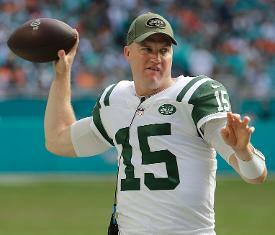 Josh McCown will start at quarterback on Sunday for the New York Jets, head coach Todd Bowles said Thursday. Starter Sam Darnold suffered a foot injury last week in a loss to Miami that has limited him in practice. Bowles said, however, that Darnold could dress and back up McCown. If Darnold is ruled out, the Jets will activate Davis Webb from the practice squad for the game against Buffalo. Darnold has struggled during the Jets' three-game losing streak. He's completed 52 of 110 passes (47.3 percent) for 588 yards and thrown two touchdowns and seven interceptions. He has been sacked eight times.